Tea is a staple beverage in many Eastern and Western cultures. While "tea" can refer to any leaves, flowers, stems or fruit steeped in water, true tea comes from the tea plant, C. sinensis. The types of tea and different varieties, such as green and chai teas, differ significantly in their aesthetic and nutritional properties. Though both green and chai teas contain tea leaves, the composition of these teas differs. Green tea is made from relatively unprocessed tea leaves that have undergone minimal oxidation. The tea may contain additional ingredients, such as fruits or flowers, but both unflavored and flavored teas are considered green tea. Chai is most commonly made from the more fermented and oxidized black tea leaves, and contains spices such as cloves, cinnamon and nutmeg. Both green and chai teas contain caffeine, a natural stimulant. Caffeine acts on centers within your brain that control alertness, temporarily easing fatigue and increasing your capacity for mental and physical activity. Black tea -- including chai tea -- contains up to 72 mg of caffeine per cup, compared to up to 50 mg for green tea, according to the Linus Pauling Institute. If you're looking to lower your caffeine intake, choose green tea over chai tea, or select caffeine-free varieties of either. Flavonoids are beneficial phytochemicals found in plants, including the tea plant from which green and chai teas derive. These chemicals aid in cellular communication in your body, helping to prevent diseases that can develop from a breakdown in this communication. While both green and chai teas contain flavonoids, their chemical makeup varies. Green tea contains high levels of flavonoids called catechins, while chai tea contains high levels of theaflavins and thearubigins, according to the Linus Pauling Institute. These groups of chemicals both have beneficial effects, but may have distinct mechanisms of action on a number of processes within your cells. 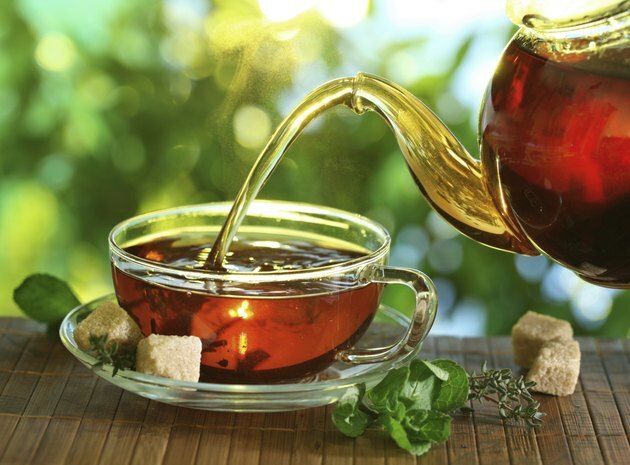 To consume a variety of flavonoids, introduce a range of teas into your diet. Drinking tea -- including chai and green teas -- may benefit your heart, though these effects have not been endorsed by the Food and Drug Administration. Preliminary research indicates that regularly drinking green and black tea may slightly decrease your blood cholesterol, a risk factor for heart disease, according to the University of Maryland Medical Center. What Are the Benefits of Green Tea Vs. Black Tea? Is Black Tea or Green Tea More Effective for Weight Loss?